"A scientific array of the world's finest waste," the poster's Kickstarter page reads. You've probably seen — but we hope, for your sake, not smelled — most of the things on this poster. 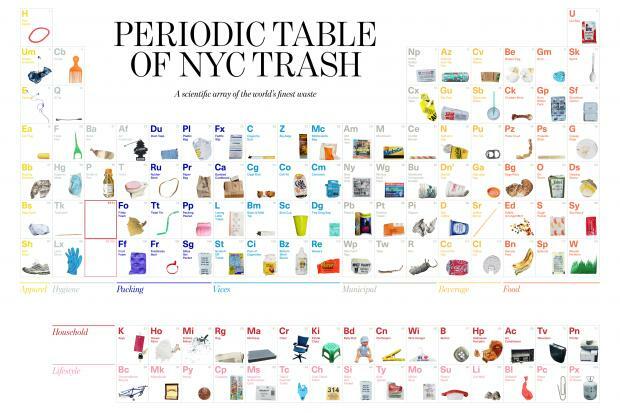 "The Periodic Table of NYC Trash," a fully-funded Kickstarter project launched in late June, organizes 118 items of garbage commonly found littering city streets into a tabular array based on their properties and uses. "Litter tells a story," said the table's co-creator Molly Young, a New York Times contributor, in an email. "It reflects the tastes and affinities and terrible habits of a city’s inhabitants. It may be ugly to look at, but it is rich with exactly the kind of 'data' we like best." Young and her friend Teddy Blanks, co-founder of the Brooklyn-based design company CHIPS, brainstormed a list of 140 articles of trash they hoped to document before hitting the streets to photograph each object "in the wild," she said. From a trash pile of 140 elements, they culled 118— as many as populate the scientific periodic table. 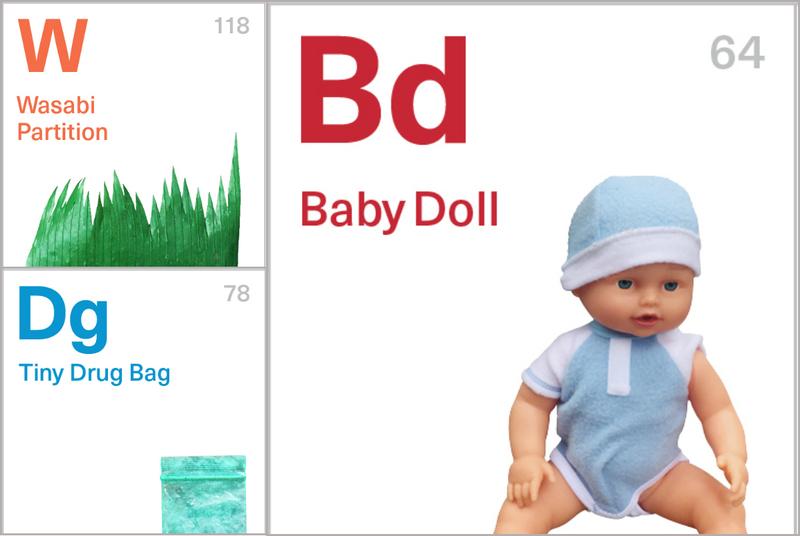 Our favorites, with their corresponding symbols: "bottom-shelf booze," or Bz; "Wasabi partition," W; "broken umbrella," UM; "bagel nub," Bg; and "bottle of pee," P, which, in Young's opinion, "wins the 'most disgusting' award." "What we love about this artifact," she continued, "is how accurately it reflects human nature: it means that someone had the consideration and focus necessary to pee in a bottle but not to deposit the pee-bottle into a trash can, which is really the human story in a nutshell." Like the table of chemical elements first invented by Dmitri Mendeleev, Young and Blank's version sorts the city's signature litter by its similarities. Items are grouped into categories like apparel, municipal, and vices. According to the poster's Kickstarter page, it has no scratch-and-sniff component (although New Yorkers may soon receive a mailer from Con Ed that is), but it did receive a glowing endorsement from New York Times crossword puzzle Will Shortz: "Ingenious!... In a trashy way, of course." A printed copy costs $40, a digital one $5. After the project officially ends July 28, you can still order the "brightly-colored portrait" of New York City culture in 2016, as Young worded it, at tableoftrash.com.